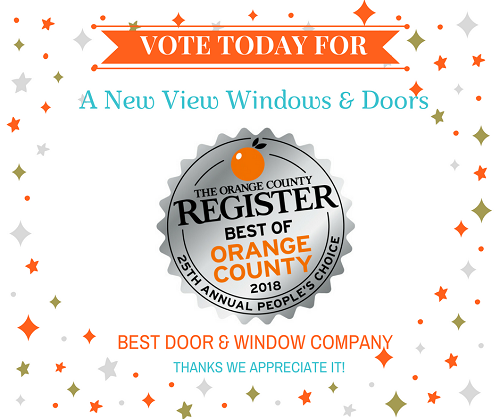 It’s that time of year again for the OC Register People’s Choice Awards and you can help us by casting your vote today for A New View Windows as the best Door and Window Company in Orange County. Vote now for the Best of Orange County 2018. For the past five (5) years from 2013 to 2017 A New View Windows & Doors was voted “Best Door & Window Company” in Orange County. Help us make it six (6) years in a row by voting online each day! Vote in The Orange County Register’s Best of Orange County 2018 People’s Choice Contest. You may even win $100 in their weekly drawing! Five (5) people will be selected to win a $100 prize in a weekly random drawing. *Rules on the OC Register page. Voting Instructions – The voting form is slightly different this year so we are providing some simple instructions. Skip links on the OC Register’s page as they just redirect back to the same page. It only takes a few minutes and we really appreciate you taking the time to vote for us. You can vote once every day until June 1st. Remember you can vote once a day and improve your chances to win $100. Thank you from all of us at A New View Windows & Doors! * See OC Register site for Best of OC 2018 Voting and Contest Entry Rules. Questions about voting or A New View Windows products and services please feel free to contact us.